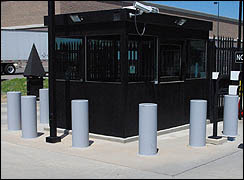 We have delivered our products and services to many installations per DOD (Department of Defense)/DOS (Department of State) regulations and specifications including crash rated perimeter security fences, gates, vehicle crash wedges, crash bollards and crash rated slide beams. We are a preferred installer of these tested and approved systems by the major manufacturers including Ameristar Fence, Ameristar Security, Delta Scientific, B & B Armor, Gibraltar Systems, HySecurity, Tymetal Systems, and more. Most likely you know and appreciate the fact that it takes a great deal of effort and hundreds of thousands of dollars to have the DOD/DOS test these systems and approve them. The manufacturers we work with go to extreme measures to assure that the systems they have invested time and money on to have approved are installed and maintained exactly to the approved specifications. 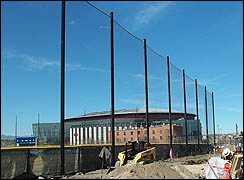 Metro Fence Company employees have undergone the rigorous training required by each manufacturer on the installation and maintenance of their systems and you can count on us to get the job done right, on time and on-budget. Metro Fence Company professionals have attended and are certified by the U.S. Corps of Engineers for “Construction Quality Management for Contractors” This certification is required for work on projects under the supervision or control of the U.S. Corp of Engineers. Our employees also have the required security clearances and have passed all the background checks that are required on military/government properties (including airports) and have been issued the appropriate clearance badges required for each installation in our region. We look forward to proving our value to you soon! Call us for a free consultation and discover for yourself how we deliver what we promise.